Ice covers everything in sight and the power is flickering as I write this. It is just light enough to see that it’s time for more coffee instead of heading down the road. Schools are closed today and the roads are treacherous, so traffic will be very light in town today. If the ice continues it will seriously hinder the usual Friday night festivities. We have a roaring fire in the wood stove and plenty of firewood, so staying warm is not a problem. sure beats sitting here with no Internet connection and no lights. 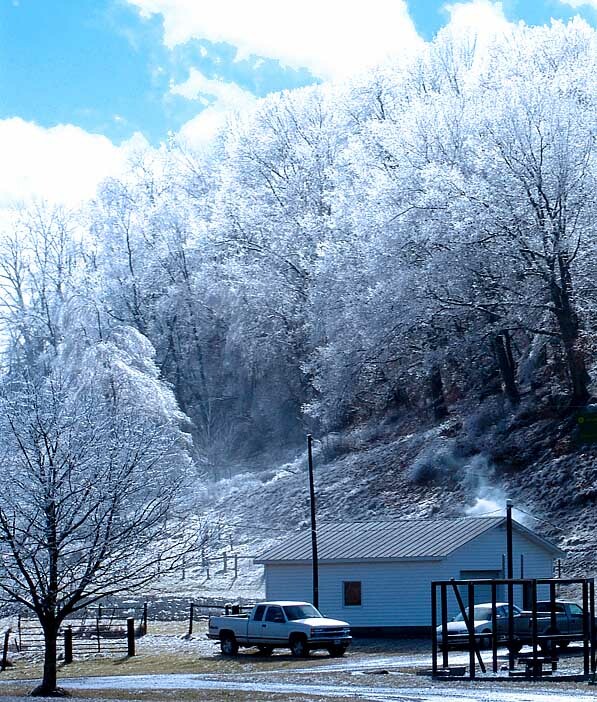 The trees are coated with ice and make a steady creaking noise as the wind blows them to and fro. It is still raining and the rain freezes on contact, so we may see branches and entire trees breaking before long. Once the sun comes up enough to get photographs, I will make an attempt to capture the scene. It’s a good day to organize the office and the workshop, and pay bills, and catch up on things I’ve let slide, like the pending basket on my desk which is overdue for handling. UPDATE: The power did go out for at least three hours. 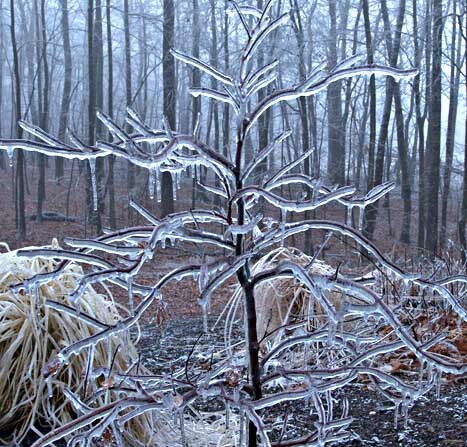 A light misting rain continued to fall and ice accumulated until branches began to break. The sun came out briefly and temperatures began to rise, so I made a run into town, dodging falling ice and branches on the way. The wooded hills along Franklin Pike were beautiful and I grabbed a few shots out of the car window. Here is a Japanese Maple showing today’s ice accumulation. Bad weather doesn’t stop us, but it sure slows things down. The good news is that we may have better weather coming. I hope so, because I still have more firewood to split and I have some new ideas for the framing business I want to put in motion. This entry was posted in Country Living and tagged Floyd Virginia, Franklin Pike, ice storm, schools closed. Bookmark the permalink. I really enjoy your site, especially the wood stove. We had a severe ice storm here in Oklahoma that did alot of damage but the good thing is there are tons and tons of free firewood for the picking piled up. I spend alot of my time cutting and splitting wood for our wood stove. I would love to get my hands on a DR splitter like yours. The maul can be a challenge.